Labrador, mainland section of the province of Newfoundland, lies almost entirely north of the Island, 20 km across the Strait of Belle Isle, and some 800 km south of Greenland. The long (1125 km) Labrador coast is indented by innumerable fjords, bays and inlets, notably Hamilton Inlet (Lake Melville), which penetrates the rocky interior for over 250 km. Geologically, Labrador is part of the Canadian Shield, a massive granite plateau rising some 300 m from sea level to the interior watershed. Most of coastal and northern Labrador is bare rock and barren tundra, but river valleys south from Lake Melville and the deep interior contain valuable forest reserves. The area was known by the Norse as Markland. The Torngat mountains of the far north rise in splendid isolation - the highest peaks east of the Rockies. Though in the same latitude as the British Isles, Labrador's forbidding terrain and extreme climate support only sparse settlement. The Labrador Current, sweeping south from arctic waters, chills the coast and clogs harbours with ice from Dec to May. The primary settlements are Forteau, Port Hope, Simpson, Cartwright, Rigolet, Makkovik, Postville, Hopedale and Nain south to north along the coast; North West River and Happy Valley-Goose Bay on Lake Melville; and Churchill Falls, Wabush and Labrador City in the interior. The population of Labrador is 27,864 (2001 census), including some 30 percent Aboriginal peoples, including Inuit, Innu, and Métis. 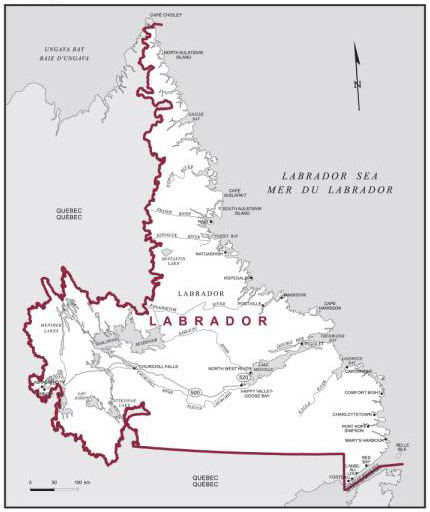 Labrador’s area (including associated small islands and inland water surfaces) is 294,330 square kilometers (113,641 sq mi)). It has a land area of 269,073.3 km² (103,895.5 sq mi), approximately the size of New Zealand. Its former capital was Battle Harbour. The name "Labrador" is one of the oldest names of European origin in Canada, almost as old as the name "Newfoundland". It is named after Portuguese explorer João Fernandes Lavrador who, together with Pêro de Barcelos, first sighted it in 1498. Most non-Aboriginal settlement of Labrador occurred due to fishing villages, missions, and fur trading outposts; modern settlements have been created as a result of iron ore mining, hydroelectric developments, and military installations. Until modern times, difficult sea travel and lack of general transportation facilities discouraged settlement. In the 1760s, Moravian missionaries began settling, building missions and often sharing in the fur trade with the Hudson's Bay Company, which was the dominant force on the peninsula until 1870.